Dr. Claudia Cabello Hutt’s academic aspirations began under a dictatorship. It was Chile, in the 1980s, and the cultural and intellectual life of the country was depressed. Countless teachers, university professors and other intellectuals had fled because of the authoritarian military government. Cabello Hutt was a young girl with big dreams and a lot of curiosity. But she had few role models. That question led her to pursue graduate education in the United States, where she focused on Latin American literature and gender studies – specifically, the works of women writers and intellectuals. Now, as an associate professor of Latin American literature and culture and director of graduate studies in the Dept. 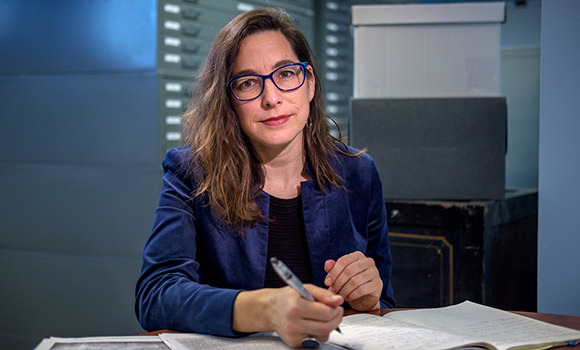 of Languages, Literatures and Cultures, Cabello Hutt is dedicated to sharing the works and lives of these women – both through her research and in the classroom. Cabello Hutt’s first book project, “Artesana de sí misma: Gabriela Mistral, una intelectual en cuerpo y palabra” (Artisan of Herself: Gabriela Mistral, an Intellectual in Body and Word), will be published by Purdue University Press in April. The book unpacks the myths and misinterpretations of the Chilean Nobel laureate, who, according to Cabello Hutt, was heavily idealized after her death. The story of Mistral’s journey – one of adversity, yet ultimately great success – often resonates with Cabello Hutt’s students. Cabello Hutt is working on a new project that traces transnational relationships among women artists, writers and patrons of the arts who lived between the 1920s and late 1940s. Specifically, she’s interested in queer women – those who rebelled against norms of sexuality, reproduction and economic dependence – from Latin America, Spain and the United States, and the networks they built. The project will serve as a resource for scholars in the fields of cultural sociology, art history, literature and gender studies. And it will unearth the stories of women who shaped literature and art – women who can serve as role models for Cabello Hutt’s students.